The latest in the Great Canadian Turtle Race! I was home, ready to start dinner when the turtle hotline rang. One of my favourite people was on the phone. John Angus MacIntyre works in the Conservation and Protection Office in Port Hood, Nova Scotia. John Angus is always kind and funny. He is also smart and resourceful. Things get done when he’s involved. Judique is a good three hours drive from Halifax where our office is. I looked out my kitchen window. Snowflakes were drifting down in earnest. “I’ll go out and have a look at it and make sure it won’t get washed away in the tide. Then we’ll help you deal with it in the morning. I’ll call you first thing,” he said. It was dark by this time and freezing cold. The wind by the shore would be sharp and bitter. But John Angus collected his camera and drove to the beach—long after his workday should have ended. Within a few hours, a set of photographs appeared in my inbox. They were of a loggerhead turtle, its body encrusted in snow and frozen sand. 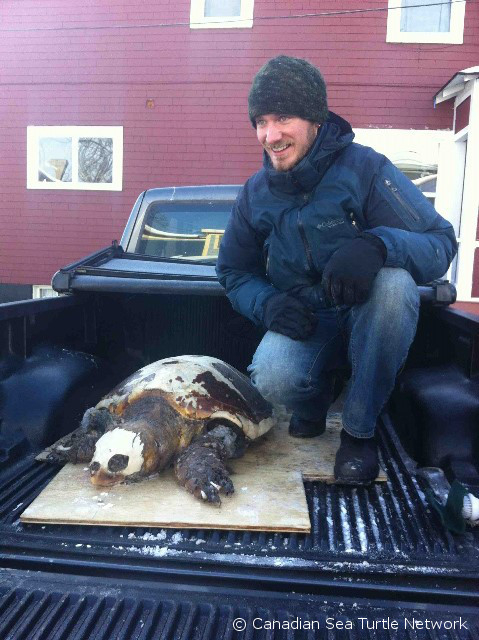 This isn’t the first sea turtle to wash up dead in the winter. There have been several over the years. The photographs are truly Canadian—a real reminder that we work with these animals in a place that is radically different from the places they inhabit in the south. The loggerhead is now in the back of our field truck. This is a picture of it with Devan, our turtle technician. The turtle is a juvenile and, as you’ll notice, it has been dead for a while. The skin has worn off its head, parts of its flippers are missing, the bone on its shell is exposed in many places. But it is still something quite amazing to see. The loggerhead’s next stop is the Canadian Cooperative Wildlife Health Centre at Atlantic Veterinary College in Charlottetown, Prince Edward Island, where our friend and colleague Dr. Pierre-Yves Daoust will perform a necropsy (which is like an autopsy) to determine its cause of death. Our best guess now is that the turtle died of hypothermia. We’ll keep you posted.